This subscription version of the Controlled Vocabulary Keyword Catalog or CVKC, can be imported as a thesaurus into version 1.2 or later of AntZero's Atomic (separate AtomicView purchase required) using a Special Text file written to work with AtomicView version 1.2. 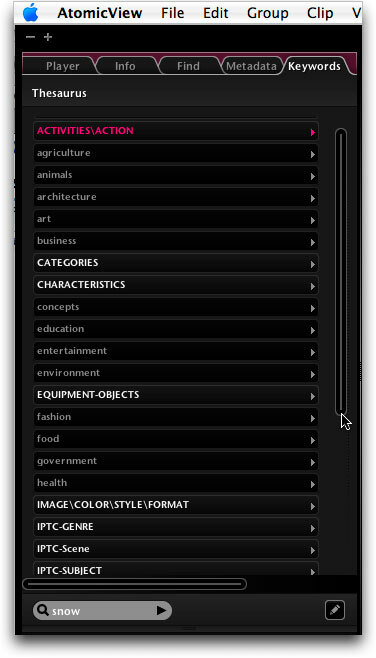 You can access the thesaurus from the Keyword tab in the upper left of the AtomicView user interface. The full version 3.0 of the CVKC contains approximately 11,000 terms organized in a hierarchical structure with segregated synonymsand excluded category header terms. For detailed information on how to install the CVKC see the Atomic View support page. The CVKC-FAQ (Frequently Asked Questions) page covers other specific questions. Just a few of the more than 30 top level hierarchies can be seen in this screen capture. Subscription: You can concentrate on your keywording instead of creating and maintaining a keyword catalog with a"subscription"** to the Controlled Vocabulary Keyword Catalog. You will receive periodic update notifications and be granted password protected access to the download location. The AtomicView thesaurus feature offers a "merge" option which allows you to integrate updated versions with your existing keyword catalog effortlessly. In addition, all updates to the CVKC contain a file with changes noted from the previous version, in case you wish to manually integrate the update with your personal copy of your keyword vocabulary list within AtomicView.